Bored of blackjack? Peed off with a poker? 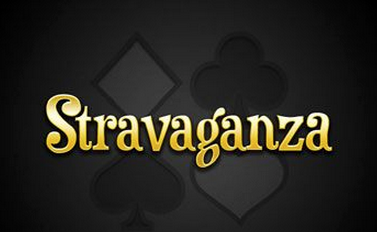 Then it sounds like you could do with a few rounds of Stravaganza – a fun, unusual card game available at selected Playtech casino sites. Bored of blackjack? Peed off with a poker? Then it sounds like you could do with a few rounds of Stravaganza – a fun, unusual card game available at selected Playtech casino sites. Collect your casino bonus and try it today – the aim is to accumulate more points than the dealer – do this, and you could rack up some very big financial rewards indeed. Stravaganza is something of a polarising game from software giants Playtech – some will love it, as a welcome break from run-of-the-mill card games, others will hate it, because it's just so darn different. 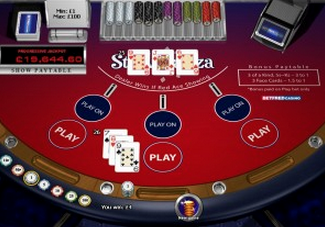 The aim of Stravaganza is to have the sum of your three cards higher than the dealer's three cards. You start the game by making your initial wager, which can be as low as 5p and as high as £100. You are dealt two cards face up, the dealer is dealt three face down. Once you have received your cards, you must decide if you want to continue – click Play On to do this, so your ante wager will be doubled and you'll get another card. Your cards will then go up against the dealer's and the player with the highest sum wins. All face cards count as 10 and aces count as one. You may be eligible to receive half or all of your ante-bet back, if you are initially dealt cards with a sum less than 9. Rake in big wins with hands similar to poker, three face cards, or three of a kind. 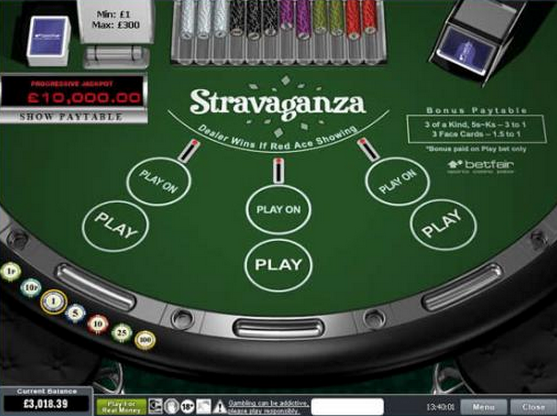 Most casino card games have boring graphics and music, but you'll definitely find the design in Stravaganza top-notch. Chances are, you've not played this game before, you'll find detailed instructions in the Help section.